MAN, OH MAN, WHAT A WINE! 2006 SF INTERNATIONAL WINE COMPETITION. 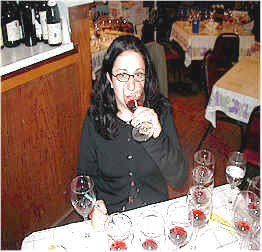 2005 SF INTERNATIONAL WINE COMPETITION. $100,000 WORTH OF WINE MARKETING ADVICE: FREE! Study Reveals Experts Taste More Than What's In the Glass! We wanted to have a look at some of the current releases of Pinot Noirs from California's Central Coast. This region is home to many serious Pinot Noir winemakers. While it would have been ideal to taste wines from a single vintage, we assembled a group of wines from the 1999 and 2000 vintages. 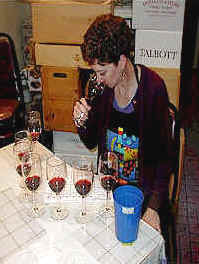 The wines proved to be a challenge to the tasters. We noticed the aromas changed constantly over the course of the tasting. Wines that had great aromas were lacking in flavors. Wines with less interesting aromas were more satisfying on the palate. One wine was a length or two ahead of the pack. A couple of wines were behind the pack, but not by a huge margin. 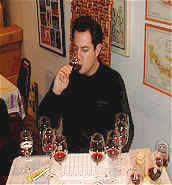 Six of the eight wines garnered a first place vote. Three of the eight avoided being tabbed as a last place wine. 8th Place: STEELE 1999 "Bien Nacido Vineyard"
Described by one person as "Astringent up front, with hints of wild berry fruit, an almost spritzy quality and a metallic finish," this wine was nearly universally disliked. Someone else described it as "Older tasting, with dried orange peel fragrances and a sour edge...it's also flat and thin." Another taster pegged it as "Port-like, old with some Zinfandel, brambly notes." One fellow downgraded it as it displayed "green, vegetal notes." I found some hay or weedy fragrances with a warm and ripe fruit quality that later reminded me of cherry candy and, finally, root beer. The flavors veered off into the root beer/cola or sarsaparilla with some dark cherry flavors. Limited aging potential, so probably best to drink now. 7th Place: SANFORD 1999 "Sanford & Benedict Vineyard"
One taster felt this was "the most Burgundian wine of the group, with some metallic notes, but some smoked meat, tart cherries and red licorice." Another panelist found a "tough edge to this with some unripe plum fruit and some vegetable notes." One person said it had "the biggest nose with lots going on here, but it's rather sour." Another found it "herbal, toasty, cherryish and warm, with hints of Burgundian qualities...the structure is suspect, but the wine is good." I was reminded of the "beet root" notes of some Burgundies, with a gamey note. It seemed to change, veering off towards a stalky or stemmy character in the nose. Mild tannins and medium bodied, the wine shows a bit more fruit and less vegetal character...with a bit more concentration, this would have been impressive. Three to six years of aging potential, it merits a one star rating (three star maximum, no stars for "average" or standard quality). 6th Place: LAETITIA 1999 "La Colline"
This ambitiously-priced wine comes from the former Maison Deutz facility which is now owned by Roederer. "It has the most oak." said the first critic. "Oaky Kool-Aid, sharp and peculiar." said the second panelist. Another person liked it, finding this to be "big and chunky, with hints of cloves, licorice and some burnt oak." One wag said "If Silver Oak made Pinot Noir, this would be it." Another taster found "Dark, rich notes of cassis, with some beefy, meaty, cherry notes and a medicinal finish." I liked the fragrance, having this leading the tasting based on aroma and bouquet. Lots of deep, berry notes, dark red fruits with toasty oak and some vanillin notes. Though impressively full-bodied on the palate, the wine is hot and tannic...quite aggressive on the palate, it does sport cocoa and dark cherry fruit, but in the manner of a high alcohol, bull-in-a-China-shop Zinfandel. One star. 5th Place: STEPHEN ROSS 2000 "Bien Nacido Vineyard"
"Short finish and a bitter aftertaste." were the biting comments from the first person to offer an opinion. The second sounded more positive, finding "Sweet bing cherries with a silky feel on the palate." Another person detected "Good fruit, mildly tart cherries with some oak nuances on the finish." Someone else pegged it as being "fruity and jammy with a medicinal quality." A couple of tasters found some spice notes, both describing this as being "Syrah-like with some peppery elements." One fellow didn't care for the nose and said it's "worse on the palate...some sort of soda pop!" I found light spice and berry fragrances with more white pepper than cherry fruit. The cherry and berry flavors are nice and up front, though it seems a bit lighter in the middle and on the finish. Perhaps time will allow this to flesh out? Half a star at this point. 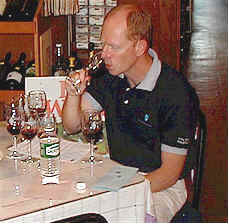 4th Place: STEPHEN ROSS 2000 "Edna Valley"
"This shows oak dominated flavors with vanilla spice, tea and sage notes. It seems to have a bit of tannin and needs time to soften." said one fellow. Another person found it "flat and over-oaked, though it does have ample acidity." Someone else said they liked this quite a bit, at first, saying its bitter finish dropped it in the ranking. Another person marked it down for "its lack of depth and concentration...but it's what I expect with Pinot Noir." I was more positive in assessing this, liking the cherry fruit. It was easy to find the "Pinot Noir" here. The cherry notes shine on the palate, with a touch of strawberry and a wee bit of tannin. Oak is kept in the background. It probably can go 4-8 years in the cellar. One star. 3rd Place: SANFORD 1999 "La Rinconada"
One taster described this as "The Turley-esque version of Pinot Noir...big, full, jammy, ripe and hot." Another person echoed the "hot" sentiment, finding this to be over-ripe, with brambly fruit and overtones of cedar and tree resins." Someone else noted "Smoky tones, ripe cherries and strawberry, rhubarb fruit." The wine showed some forest-floor fragrances initially, with a composty note. It really changed over the course of the tasting. I found, at one point, a hint of "sweaty saddle," which changed into a smoky, charred note towards the end of the evaluation period. Some severe tannins give this wine "grip," but it seems quite intense (darker color than the rest of the field...how did they manage that?). As with many of the wines in this flight, the flavors were a bit different from what you might have expected based on the nose. I thought this was much "cleaner" on the palate, for example. Four to eight years of aging seem to be possible. One-and-a-half stars. 2nd Place: DAVID BRUCE Chalone "Brosseau Vineyard"
One taster found "carnations and floral fragrances, with some heat on the palate and a woody, bitter character towards the end." Another found this to be earthy and tannic and lacking in flavor. One critic found "herbal, extracted dill aromas with little Pinot Noir fruit...warm, ripe and a bit flat." One person described this as "Broad and supple, with blackcurrants and a sweet cherry finish...not overly impressive, though." Another found some hints of "green pepper with nice structure and a long finish." 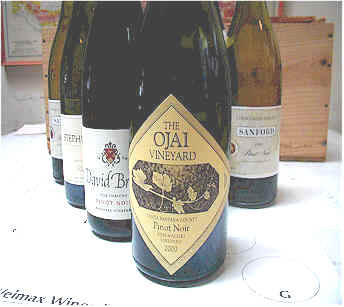 1st PLACE: The OJAI VINEYARD 2000 "Bien Nacido Vineyard"
More than a few tasters wondered whether or not this wine had some residual sugar. I thought it might have a hint of sweetness, so we checked it and it registered as "dry," not showing even three or four grams of sugar! One taster found some "Beaujolais notes, reminiscent of a wine that's had some whole berry fermentation." Someone else found "herbal fruit notes in this soft and round, cherryish red...also a hint of cola." Another taster detected "Nice berry and oak with a hint of herbs...the most complex wine of the tasting with a long aftertaste and nice balance." 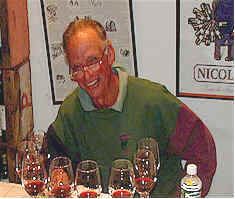 One person proclaimed the Ojai wine as "the most Burgundian." Another found it "quite varietally correct with toasty oak...a bit warm, but very nice!" I found good cherry and berry fragrances with light oak. The fruit seems nicely ripe, without going overboard. If I can criticize the wine it's simply that the acidity seems a tad low with the tannins are a bit more forceful. I will be interested to see how long it lasts. On the other hand, a duck or lamb dinner tonight with a bottle of this....! One-and-a half stars. Please note: The wines tasted are not always wines we have (or have had) in the shop. Many bottles are merely for our enological exploration. Price quoted are current at the time of the tasting, but may be different when you're reading this. BUT WE DO POST THE RESULTS OF A PRIVATE TASTING GROUP THAT'S BEEN MEETING FOR MORE THAN 40 YEARS! We are working on organizing some blind-tastings at the shop. Send us a note to indicate your interest in participating. These would be on Wednesday evenings and you'd need to bring 8 wine glasses. PETITE SIRAHS of Current Release.